Finding sufficient and affordable capital to finance the transaction will strongly influence whether or not you can make a deal. And as part of the acquisition, you’ll want to obtain enough financing to support the business’s working capital needs. Though you may be acquiring a business with a long operating history, however, businesses with new owners must reestablish their creditworthiness, which can make it more difficult to find funding for working capital at the time of the acquisition. The good news is that this circumstance need not rule out the deal. Several months after procuring acquisition financing, you’ll likely be able to more effectively raise funds to support the company’s working capital needs than you would at financial close. Here’s how you can raise funds after an acquisition most effectively. As the new owner of a business, your ability to access capital will improve after your first few months in charge. In fact, you may be able finance your working capital needs more cheaply after you’ve run your business for several months. This can work in two ways. First, you can reduce the amount of working capital funding required in the first place. You can do this by improving production operations, inventory management, sales relationships and supplier relationships, to name just a few ideas. By speeding up the production process and holding less inventory, for example, you can reduce both the amount of time it takes you to generate cash as well as the amount of cash you need to pay to suppliers. The second way you can finance working capital more cheaply is that, as you accumulate your own operating history, you’ll be able to unlock more generous financing terms – more capital and lower interest rates. As you accumulate a sound track record with the acquired company, you’ll shed this unfavorable impression. This spring, we worked with a manufacturing-focused private equity firm that had recently acquired a Michigan-based manufacturing company. The private equity firm completed the acquisition with a step-by-step plan to grow revenues. Fundamental to their plan was procuring the necessary supplies and inventory to do business, for which they needed additional funding even after completing the acquisition. Despite a strong operating history dating back several decades, the manufacturing business, like many other newly acquired companies, was ineligible for traditional small business financing options. Given new ownership, it needed to reestablish its creditworthiness. After several months in charge of the manufacturing business, the private equity firm had an easier time finding funding to support the manufacturing business’s working capital needs. 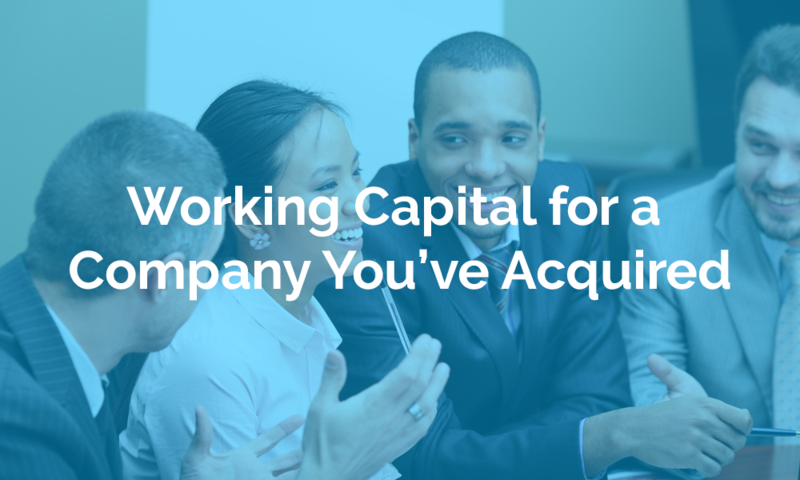 If you can’t find working capital financing as part of the acquisition, you still have options. Feel free to reach out to us if you’d like to discuss how you can navigate the financing process effectively.